Pvt. 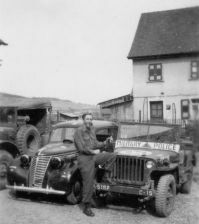 Clines’ Military Police Jeep – Somewhere in Germany Photos courtesy of William W. Cline. Chuck Nantz met Mr. Cline and the subject of WW2 and jeeps came. Chuck sent me the pictures given by Mr. Cline. I called Mr. Cline to see what details he could share about the pictures. Mr. Cline told me that he had served as “the oldest guy in the unit” to fight all the way to the Rhine with the 3rd Division and then transferred to the MPs. 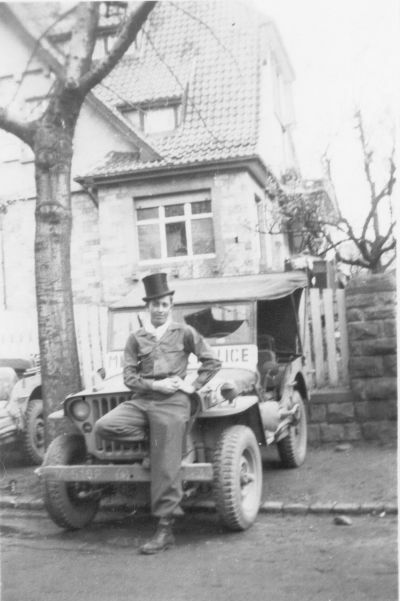 This is a picture of Private Cline, “somewhere in Germany, April 1945.” He was assigned to the 7th Army, 516 MP. They were just goofing around for the camera, apparently they had stumbled upon a selection of this dapper hats in the village and borrowed them for the picture. Private Cline ready for roadblock duty. Notice the flowers in his shirt/jacket pocket. He appears to be wearing a HBT uniform with the buckled topped combat boots. 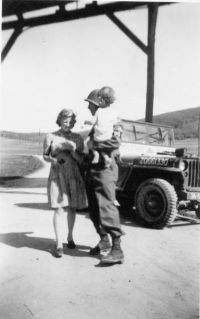 Private Cline on road block duty holding baby while German woman looks for papers or pass. 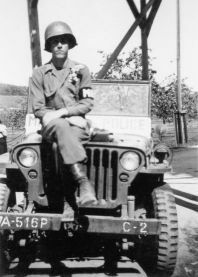 A picture of Private Cline in a vehicle lineup. The jeep in this picture is a GPW. Note the US painted on the glass in the windshield and the hood blocks appear to be the shape of the rubber style blocks.